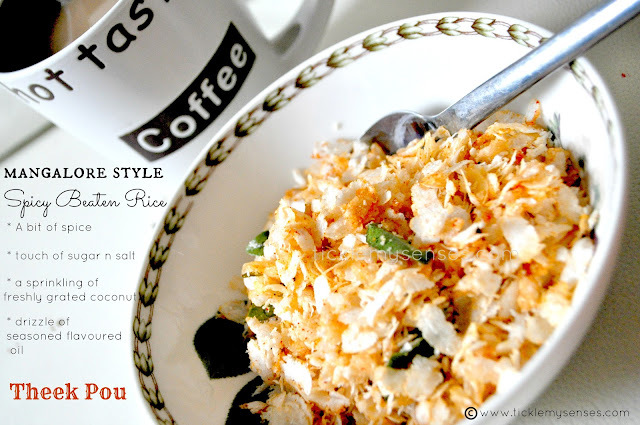 Tickle My Senses: Mangalore Style- Spicy Beaten Rice/ Theek Pou. To go along with the Steamed Nendra bananas I posted early this week I made this very simple and quick Pou/ poha/ beaten rice. When Baby A was 3 months old we flew to India for his Grandparents, Uncles Aunties and Cousins to meet him. At the time my mom engaged for me a 'Balnti Posteli' ( 'Balnti' in Konkani means 'new mom', 'Posteli' means to 'look after/care for') or a ' lady to look after the new Baby and Mom'. It is tradition in most Mangalore Catholic homes to employ these experienced women for the first 40 days after birth, to help a mom make the transition smoothly. She stays in the family home cooks healing and nourishing dishes for the new mother and cares for the newborn with daily oil massages, bathing, burping, nappy changes and nap times. Finding a good 'Balnti Posteli' is taken very seriously and the search for one begins 3 months after conception. As Baby A was born in the UK, I got to meet her only when baby A was 3 months old. Well this was one of the dishes she used to make for breakfast. I enjoyed it so much, that I learned to make it from her. Serve alongside Steamed Nendra bananas or drown the poh in milky tea or coffee and savour it ! 1. 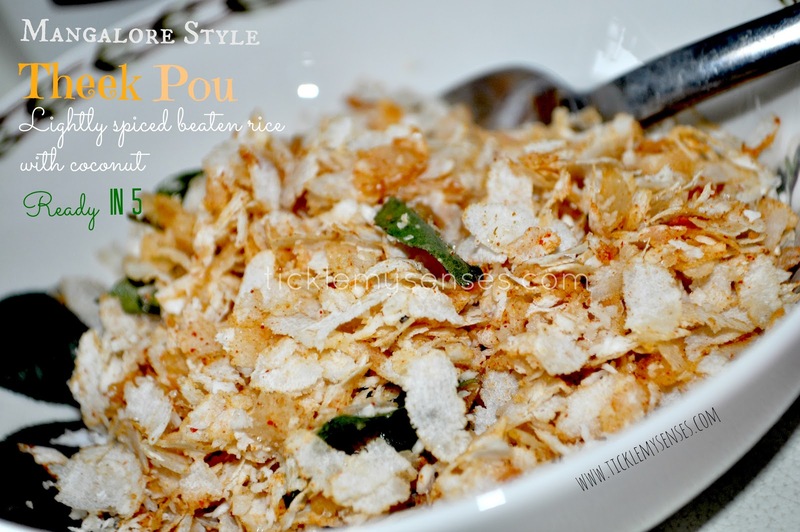 In a bowl take thin beaten rice or bareek pou. Sprinkle over the three spice powders ie. chilli, corinader and cumin. 2. In a small bowl take around 1/2 tsp of salt. Dissolve it in 3 tbsps of water. 3. Add the salted water a little at a time to the beaten rice and use your fingers to lightly massage the spice and water into the beaten rice. Continue adding salted water till the beaten rice starts to very slightly soften. Taste the pou for salt. Add more salted water if required. 4. Sprinkle over freshly grated coconut and mix well using fingers. 5. Lastly sprinkle over sugar and gently mix . Serve as it is or do the seasoning. Take oil in a pan, when hot splutter mustard seeds, add curry leaves fry till crispy, pour over pou and mix well. If you enjoyed this post or any other, share it with your friends, please do drop me a line in the comments box at the end of this post, on my Facebook page or at carol@ticklemysenses.com, would love to hear from you.